Habit: Annual or subshrub, glabrous. Stem: generally many-branched, appearing jointed when young; internodes green to glaucous, fleshy when young. Leaf: opposite, sessile, decurrent; leaf pairs fused at base, enclosing stem. Inflorescence: spike, terminal, cylindric, dense; bracts leaf-like; flowers generally 3 per axil, sessile, sunken in fleshy bracts of distal internode, adherent to each other and to bracts, forming a 3-parted cavity at flower-fall. Flower: calyx fleshy, 3--4-lobed at tip, +- deciduous in fruit; stamens 1--2; stigmas 2--3. Fruit: wall membranous, free from seed. Seed: vertical; seed coat membranous, pale brown, hairy [papillate]. Species In Genus: +- 50 species: +- worldwide. Etymology: (Greek: salt horn) Note: Needs study. Salicornia subterminalis moved to Arthrocnemum. Habit: Subshrub 10--70 cm. Stem: spreading to erect, occasionally rooting at base; few- to many-branched. Inflorescence: spikes 20--85 mm, 2.5--5 mm wide, longest with 12--40 fertile nodes. Flower: central flowers 1--2.5 mm wide, separating lateral flowers; anthers 0.7--1 mm, dehiscing after exsertion. Seed: 1.2--1.5 mm, hairs 0.1--0.2 mm, hooked, curved. Ecology: Salt marshes, alkaline flats; Elevation: < 800 m. Bioregional Distribution: NCo, SnJV, CCo, SnFrB, SCo, s ChI, PR, DMoj; Distribution Outside California: Baja California. Flowering Time: Jul--Nov Note: Occasionally misidentified as Salicornia utahensis Tidestr., not present in California. Synonyms: Sarcocornia pacifica (Standl.) A.J. Scott; Salicornia virginica L., misappl. Unabridged Note: Salicornia utahensis reported from California, but specimen is Salicornia pacifica. Salicornia utahensis occurs in several adj states, so it might be expected to occur in eastern California: spikes terminal, fertile nodes < 12; anthers 0.9--1.8 mm; seeds smooth, papillae short (0.6--0.9 mm), straight, on one edge. 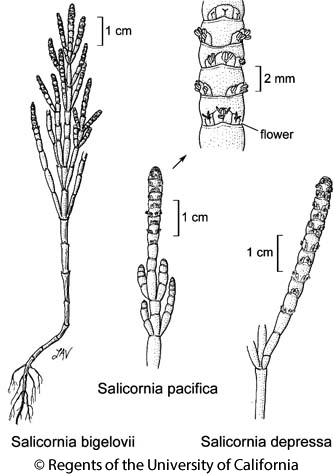 Citation for this treatment: Peter W. Ball 2012, Salicornia pacifica, in Jepson Flora Project (eds.) Jepson eFlora, http://ucjeps.berkeley.edu/eflora/eflora_display.php?tid=42666, accessed on April 22, 2019. NCo, SnJV, CCo, SnFrB, SCo, s ChI, PR, DMoj; Markers link to CCH specimen records. Yellow markers indicate records that may provide evidence for eFlora range revision or may have georeferencing or identification issues. Purple markers indicate specimens collected from a garden, greenhouse, or other non-wild location.